This Audio Visual Cart is Ready to Ship! This Display is Affordable and Stylish! 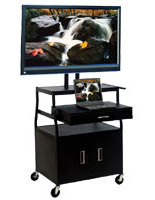 This Audio Visual Cart Ships Fast When in Stock! Holds the majority of flat screens up to 55" weighing less than 130 lbs. (4) 5" Industrial plate swivel caster wheels with two locking for an easy to move cart. Side shelf that extends outwards to hold a laptop or other notes/equipment for presentation purposes. 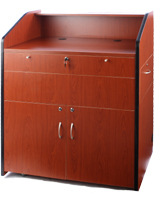 Security storage cabinet with two doors for ample space to hold expensive equipment while not in use. 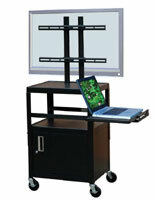 This audio visual cart that has a stable pyramid shaped design can hold larger flat screens weighing up to 130 lbs. 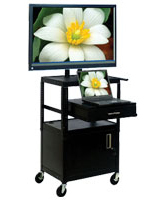 This mobile media trolley can hold an led screen up to 55" to present to larger rooms and provide good screen visibility. This AV equipment furniture, audio visual cart that includes a two door security cabinet secures media devices while not in use. The storage space is ample with this classroom furniture. 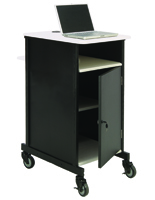 This mobile audio visual cart has 4 easy rolling wheels, two of which lock to keep in place while in use. This office presentation display ships unassembled to save on costs. This audio visual cart reduces the risk of electronics breaking since two of the wheels lock into place. This mobile workstation is ideal for establishments that want a versatile unit that has the option of being used in different areas of a room or building. 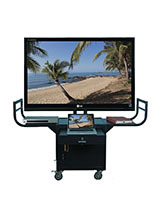 This audio visual cart can hold a dvd player, laptop, projector and more equipment in addition to the flat screen television. This display comes with a UL listed 15' power cord and 4 outlet with surge protector so users only need to supply media devices! 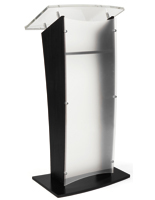 This audio visual cart is constructed of quality, durable steel. This office furniture is a great presentation stand. This flat screen audio visual cart, also known as a media equipment trolley, uses security screws on the tv mount. The mounting posts include in post cable management to keep wires organized and hidden. 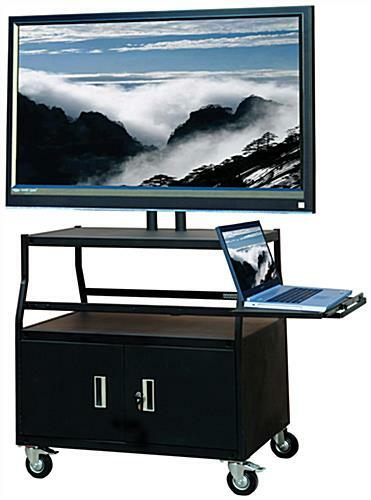 This audio visual cart that has a side shelf provides a great place to put a laptop to control the on screen presentation. This media storage furniture has 5" industrial plate casters to provide easy mobility even with the flat screen mounted on. These AV trolleys have a sleek and stable pyramid design. Manufacturer mode l #FPCAB4420E. 40.0" x 44.0" x 24.0"
39.0" x 17.0" x 23.0"